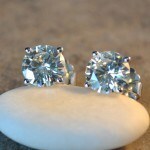 Forever Brilliant 1 Carat Stud Earrings – Gorgeous stud earrings, set with Forever Brilliant round moissanites. The stones are 5mm across, each is .5 carat, so one carat of beautiful sparkle here, for well under $500. Set in 14k white gold. The perfect gift! Note – In the photos, the 3 prong earrings are the item you’ll receive. 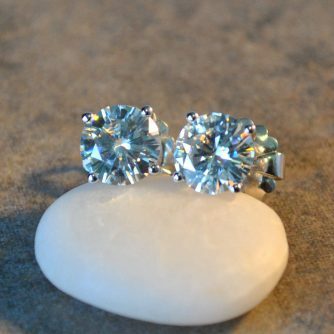 I didn’t have a good photo of those, and I wanted you to see how gorgeous Forever Brilliant’s are, so the “real” photos here are of larger earrings with 4 prongs, you’ll receive settings with 3 prongs as stated.